Looking to schedule a field trip for your summer camp group? 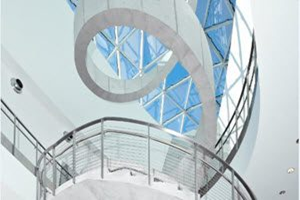 Visit The Dali Museum this summer for an exciting cross-cultural journey through surreal art. Campers will learn how to look at art from one of the most renowned artists of the 20th Century in an age-appropriate environment by enjoying thought-provoking, interactive guided tours and scavenger hunts, exploring the garden labyrinth, and making their very own Dali-inspired mustache. age-appropriate audio tours when available, or download the free Dali Museum virtual tour app at www.itunes.apple.com or www.play.google.com. All camp groups require a reservation at least 3 days prior to their arrival to receive special pricing. A deposit is required to secure your reservation and final payment is due 48 hours prior to arrival. Museum etiquette guides are available for download prior to group visit. For an additional $10 per person, campers can engage in a surreal adventure through a private docent-led tour. 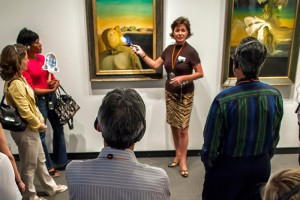 Hour-long docent-guided gallery tours are available at selected times daily. Complete your visit with a picnic lunch from Cafe Gala. To-go bag lunches are available for advanced purchase from the Museum’s Cafe Gala and can be ordered prior to your visit. Please contact Jenn Fletcher or Chuck Bandel for details at 727.623.4725 or cafegala@thedali.org. Menus can be viewed here. Questions? Email us at groups@thedali.org and we will be happy to make your reservation.